In 1938, the members of the League of Nations agreed unanimously that, in the event of a general war, they would not bomb civilians. In the same year, the government began investing heavily in Air Raid Precautions and looking to shelter designs, just in case the agreement signed did not hold under the pressure of a total war with Germany. Just 2 years later, Britain was subjected to continuous nightly bombing raids by the Luftwaffe for over a month in a campaign known as the Blitz. Being out and about during a bombing raid could be a dangerous affair, and with government advice being to take cover as soon as possible after hearing the warnings, the government provided several types of official and unofficial shelters for use by the public. 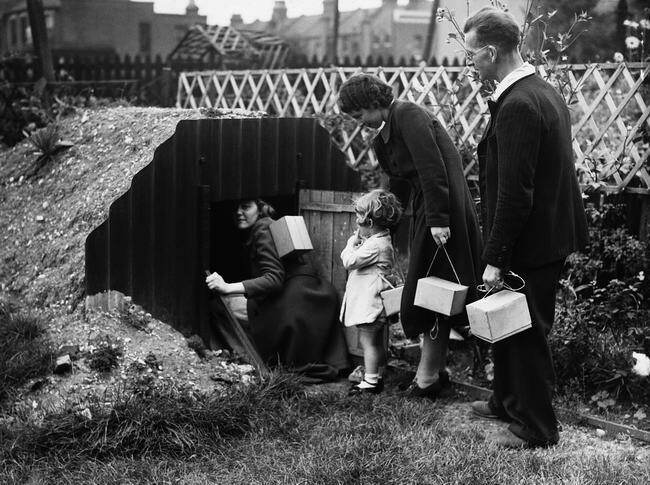 I'm going to talk about these shelters in this article, allowing you to weigh up the merits and drawbacks those methods entailed whilst seeking shelter from a bombing raid in 40s Britain. By far the most common 'private' shelters, Anderson shelters were designed to be put up at the bottom of a suburban garden, and accommodate up to 6 people. Made up of sheets of corrugated iron, the shelter was designed for easy assembly by the householder. In order to be fully effective, the shelter had to be dug into a 4ft deep pit in the ground, with the spoil being heaped on top to provide cover against nearby bomb blasts. Many people planted vegetables on top, making the most of the spoil heaped on their makeshift dugouts. Close to 3 million were erected, right across the country. Anderson shelters in winter tended to become waterlogged, freezing cold and deeply unpleasant places to be. In response, the government developed a shelter that could be used within the home. 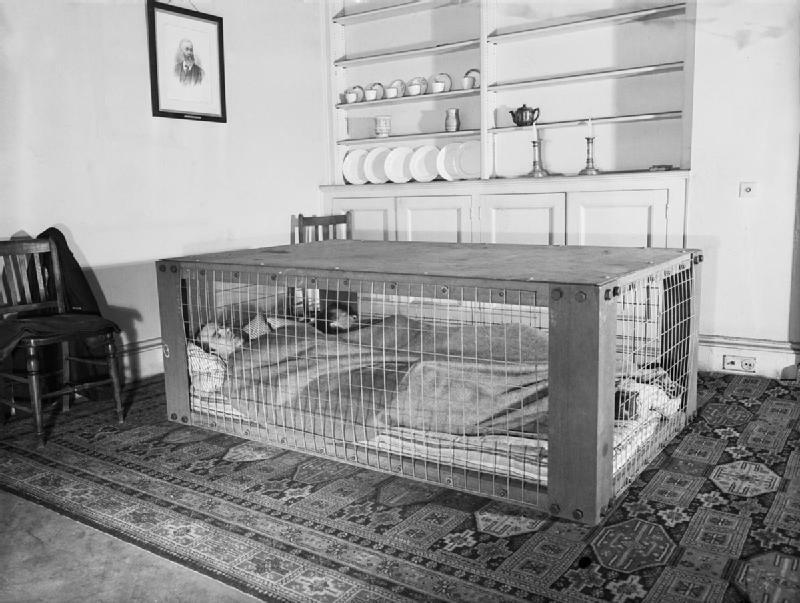 The Morrison shelter was effectively a metal cage, in which the occupants would lie until an air-raid subsided. Doubling as a kitchen table, the shelter was again supplied flat packed for the householder to assemble, despite having over 300 parts and virtually requiring an engineering degree to assemble. About 500,000 of these were used by the public. 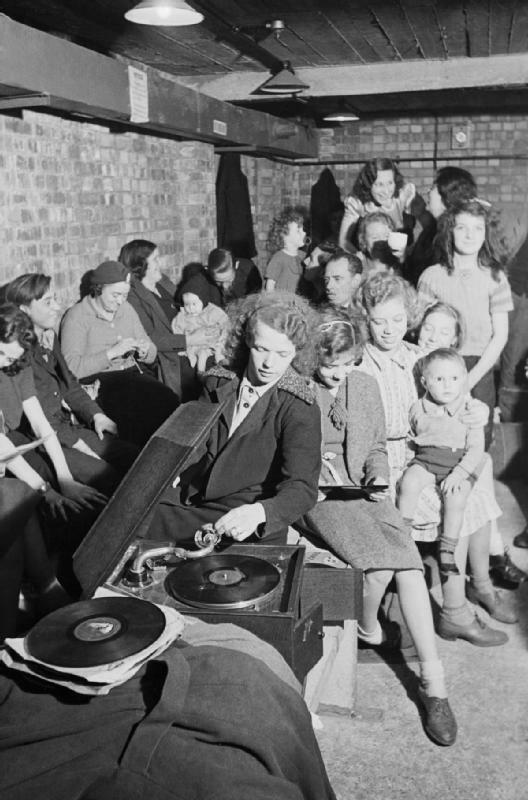 Public Air Raid shelters could be crowded, uncomfortable and loud. Fortunately, with a little perseverance, fun could be had despite the threat from bombs above. Here, a young woman works a gramophone, putting the needle into place to start a new record. If one was unlucky enough to be out shopping, visiting relatives, or otherwise outside dashing distance of home when a raid was detected, there were always the public shelters in which to stay until the raid passed. A public shelter could range from trenches dug in a local park to brick blockhouses on the corner of the street. These had at best a mixed reputation, with their flimsy construction contributing to the general unease at using them. This was compounded by a series of incidents where badly constructed shelters collapsed in on their unlucky occupants after nearby blasts, leading people to trust more in their own shelters than that of their street. Most streets in the danger areas had some form of public shelter installed. Aldwych Underground Station, along with the rest of the network, was used as a deep shelter by thousands of Londoners every night. 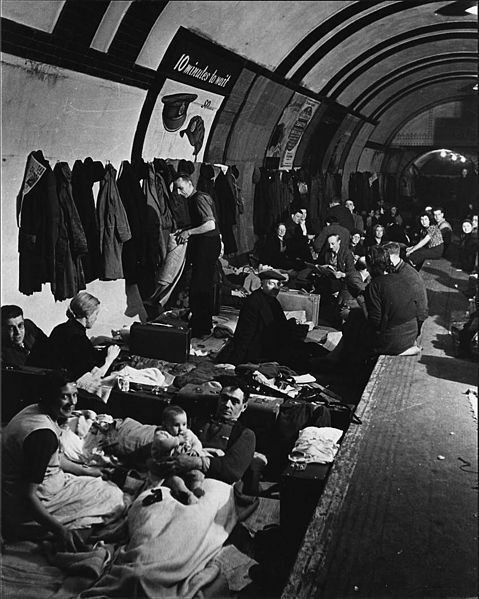 In defiance of a government ban on the use of the underground as shelter during an air-raid, many Londoners took shelter in the underground network at the height of the blitz, with the network playing host to upwards of 140,000 people on its busiest nights. Stations such as Caledonian Road (my grandmother's station of choice) became busy from 4pm, and were often full-up by 7pm of people sheltering from the blasts above. Some sections of the underground were closed entirely for the duration, with Aldwych station becoming a permanent air-raid shelter.